Players compete for dominance of the Golden Isles, each starting the same distance away from it. 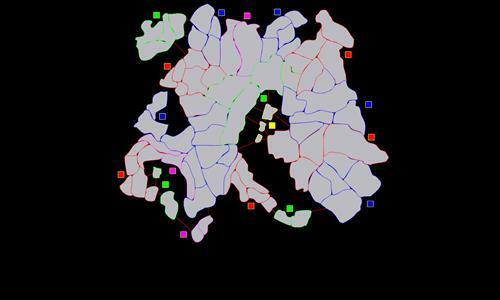 The map supports two to six players. Review by SailingGuy on 2/7/2013. OK, but not great. There are some territories that should connect, but don't connect. Review by Cheery Dog on 8/18/2013. Cursed Lands Bonus is to strong and easy to get in the slightly closer Distribution mode. Review by Ironheart on 11/23/2013. There is nothing golden about this isles; a more accurate name for this map would have been Crap Isles.Playing this map has been my biggest regret this day( my fault for not checking the settings to a tourney that is usually med earth). Avoid this map at all costs, save your self from playing on the eyesore. The whole game is reduced to who can get to the centre first. Suffice to say: i am not pleased. Never had i played such a terrible map before and i have played skunk's maps before he got better at map-making. Very cool Map big slugfest in the middle. It may not be pretty, but it's well laid out, balanced and it gets the job done.